45 Sabah DAPSY members visit Parliament, Putrajaya | Daily Express Online, Sabah, Malaysia. Kota Kinabalu: Forty-five young party members from Sabah DAPSY (Democratic Action Party Socialist Youth) visited various ministries and Parliament in KL and Putrajaya for the first time, recently.Led by Luyang Assemblyman Phoong Jin Zhe, the group was welcomed by seven ministers and deputy ministers as they engaged in discourses on various matters. "This is definitely a rare and rewarding experience for many of them," noted Phoong. The leaders of the Sabah DAPSY, who were responsible for the overall planning and leadership of the trip, included Deputy Chief of Sabah DAPSY Max Million Lee, DAPSY Sabah Secretary Mei Chan, KK DAPSY Chief George Wong, Tawau DAPSY Chief Philip Yap and DAPSY Sandakan Chief Kent. The delegation of Sabah DAPSY representatives was primarily to participate in the 2018 National DAPSY Congress held in Serdang on December 2. Phoong said he was delighted to see many of them raising different questions fervently to the ministers and deputies, including many constructive opinions and criticisms of some government policies. He believes that young party members from the ruling party must always be opinionated on government policies and to make every effort to relay their opinions and constructive criticism to the government. He stressed that the youths of the ruling party must be prepared to propose policies to improve the people's quality of life. "Through this kind of exchange visits, I believe that this will be an invaluable experience for many of our young comrades, as it is bound to increase their understanding on various policies amongst our members. Young members of the DAPSY must master the ability to analyse, criticise and recommend policies in order to contribute to the country," he said in a statement. The group paid a courtesy call on Deputy Minister of Domestic Trade and Consumer Affairs Chong Chieng Jen, Deputy Minister of Defence Liew Chin Tong, Minister of Energy, Science, Technology, Environment and Climate Change Yeo Bee Yin, Deputy Minister of International Trade and Industry Dr Ong Kian Ming, Deputy Minister of Education Teo Nie Ching, Finance Minister Lim Guan Eng and Minister of Transport Anthony Loke. Phoong also revealed that the group and Chong discussed about the high prices of goods in Sabah and how to reduce them; engaged with Liew on how to improve the security and defence of Sabah; Yeo about the high electricity bill and shortage of electricity in Sabah; and Dr Ong about the lack of industrialisation in Sabah, which had causally resulted in the rising cost of living as well as brain drain issue. The group also talked to Teo on educational issues such as the recognition of UEC, improvement of education quality, and the dilapidation of Sabah schools; and with Loke about the bus reorganisation in Kota Kinabalu and the extension of Sandakan airport runway project. They also talked to Guan Eng about the tax revenue sharing for Sabah, the need for more resources to develop the large-scale plans in Sabah, and the financial state of the country. 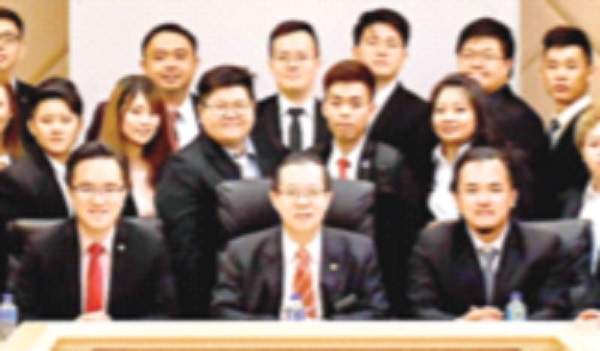 In addition to meeting the various ministers and deputies, the group also visited Parliament and exchanged views with DAP Member of Parliament for Iskandar Puteri, Lim Kit Siang, who shared his political journey and encouraged the youths to contribute to the country. Also present were Member of Parliament for Tenom Noorita Sual and Senator Adrian Lasimbang.